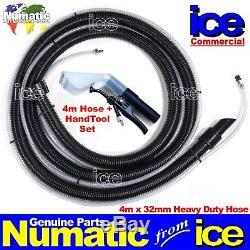 HEAVY DUTY GENUINE NUMATIC 32MM x 4 Metre CLEANTEC SPRAY EXTRACTION HOSE & HANDTOOL. From a Trusted Specialist Numatic Sales, Service & Spares Dealer since 1987 - your assurance of Quality, Experience & Expertise. Genuine/Original Numatic 32mm x 4m Spray Extraction Hose and handtool. Heavy Duty Dual Detergent Feed & Vacuum Hose for Carpet & Upholstery Cleaners. Fitted with 9mm male spigot / female quick release - for 2004 onwards machines. Tough PVC Braided Detergent Hose - less prone to kinking, splitting and perishing than rubber version. 100mm "SeeThru" Spray Extraction Trigger and Nozzle - see the dirt and moisture disappear. Fits Numatic Models like George GVE370, CT 370, CT 470, CTD 570, CTD 900 etc. Bargain Price - Save over 30 % Off Numatic List Price. Direct from Numatic - Quality & Provenance Assured. Carpet Floor Wand also available in other listings. A Full VAT Invoice will be supplied with every sale. Usually despatched sameday if ordered by 1pm Mon-Fri. Highlands, Islands & Northern Ireland will cost more - or sent via 2nd Class Post. ICE Limited - a Specialist KARCHER & NUMATIC Sales, Service & Spares Dealer since 1987. The item "4m NUMATIC GVE 370 CT CTD 470 570 HEAVY DUTY CARPET CLEANER VACUUM HOSE HANDTOOL" is in sale since Wednesday, February 7, 2018. This item is in the category "Home, Furniture & DIY\Appliances\Ironing & Vacuuming\Vacuum Cleaner Parts". The seller is "ice-limited" and is located in Chessington, Surrey.